All of our classroom posters measure 22" x 34" and include four or five worksheets that may be copied. 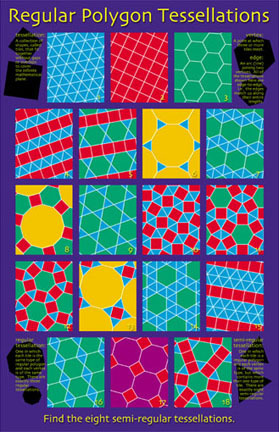 This poster shows 18 tessellations of regular polygons, including the 3 regular and 8 semiregular tessellations. Item no. 054. Suggested retail price: $11.95. 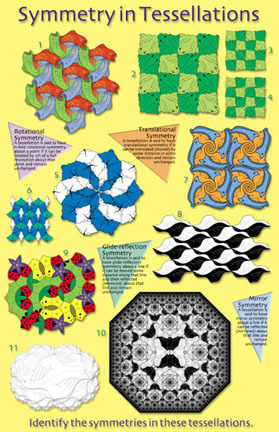 This poster uses Dr. Fathauer's creature-motif tessellations to demonstrate the different types of symmetry that tessellations can possess. Item no. 055. Suggested retail price: $11.95. 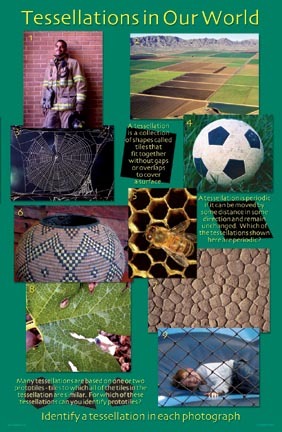 This poster uses photographs of real-world scenes and objects to demonstrate the role that tessellations play in nature and human-made objects. The objective of the poster is to help students link the math they learn in the classroom to what they see in the world around them. Item no. 074. Suggested retail price: $11.95. 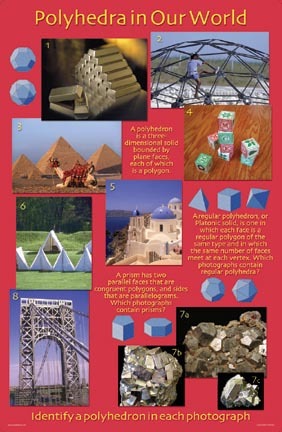 This poster uses photographs of real-world scenes and objects to demonstrate the role that polyhedra play in nature and human-made objects. The objective of the poster is to help students link the math they learn in the classroom to what they see in the world around them. Item no. 075. Suggested retail price: $11.95. 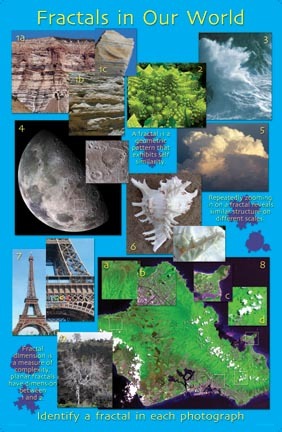 This poster uses photographs of real-world scenes and objects to demonstrate the role that fractals play in nature and human-made objects. The objective of the poster is to help students link the math they learn in the classroom to what they see in the world around them. Item no. 4105. Suggested retail price: $11.95. 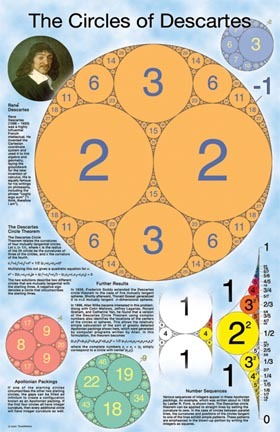 This poster describes the Descartes Circle Theorem and shows some of the beautiful and complex figures, known as Apollonian packings, that can be created using the theorem. In the early part of the 17th century, RenŽ Descartes described a simple relationship between the curvatures of four mutually tangent circles. Given the curvatures of three of the circles, it is possible to calculate the curvature of the fourth by a straightforward solution to a quadratic equation. (It may be the coolest thing you'll ever see done with a quadratic equation!) This allows the construction of fascinating figures know as Apollonian packings, in which an infinite number of circles fit inside a large outer circle. In fact, there are many Apollonian packings for which every circle has integer curvature. Some arrangements lead to intriguing number sequences, such as the squares (1, 4, 9, 16, 25 ...). Item no. 4106. Suggested retail price: $11.95. For information on purchasing Tessellations products, please click here.